I love this page, and getting a hint of the books that have guided you. I didn't see any fiber related books and would love to know what has guided you on your textile path, too. What a great idea, Shirley. I, too, prize books, but started my journal with coffee, birds and then the grandgirls. Hope you don't mind if books find their way into my journal. Great choice, Shirley--and the books are great choices, too! What a great drawing, it is quite hard to decide what to do for the highly prized topic but whilst out walking this morning I realised what I can draw so may just get started, its great to see so many different aspects. An interesting sketch, we get to see your favourite books too! It's fascinating when a person shares their love of books and even more so when they share the titles. Hi Shirley, Oh, excellent drawing and equally as excellent write up! It was fun to see that we share a couple of books. And, it was also interesting to be introduced to others! The lion is just perfect! Wonderful drawing and what a great response to highly prized. I own some of the same books and they are amongst my favorites. Twyla's wonderful, as are Gwen Diehn's books! The only one of these books that I haven't read is "Leaving a Trace". All great books and your drawing (painting) is very well done! 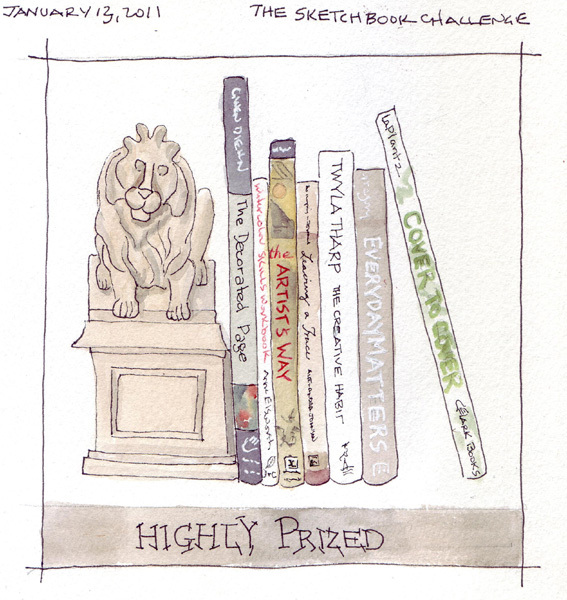 Great sketch - and I, too, recognise some of these books! Lovely drawing Shirley! The spines of the books are so symbolic a lot of times. Thank you so much for your comments and encouragements.